, or Raleigh, or‘Rawlegh, an illustrious Englishman, was the fourth son, and the second by a third wife, of Walter Ralegh, esq. of Fardel, near Plymouth. His father was of an ancient knightly family, and his mother was Catharine, daughter of sir Philip Champernoun, of Modbury in Devonshire, relict of Otho Gilbert, of Compton, the father, by her, of sir Humphrey | Gilbert, the celebrated navigator. Mr. Ralegh, upon his marriage with this lady, had retired to a farm called Hayes, in the parish of Budiey, where sir Walter was born in 1552. After a proper education at school, he was sent to Oriel college, Oxford, about 1568, where he soon distinguished himself by great force of natural parts, and an uncommon progress in academical learning but Wood is certainly mistaken in saying he stayed here three years for in 1569, when only seventeen, he formed one of the select troop of an hundred gentlemen whom queen Elizabeth permitted Henry Champernoun to transport to France, to assist the persecuted Protestants. Sir Walter appears to have been engaged for some years in military affairs, of which, however, we do not know the particulars. In 1575 or 1576, he was in London, exercising his poetical talents; for there is a commendatory poem by him prefixed, among others, to a satire called “The Steel Glass,” published by George Gascoigne, a poet of that age. This is dated from the Middle Temple, at which he then resided, but with no view of studying the law for he declared expressly, at his trial, that he had never studied it. On the contrary, his mind was still bent on military glory; and accordingly, in 1578, he went to the Netherlands, with the forces which were sent against the Spaniards, commanded by sir John Norris, and it is supposed he was at the battle of Rimenant, fought on Aug. 1. The following year, 1579, when sir Humphrey Gilbert, who was his brother by his mother’s side, had obtained a patent of the queen to plant and inhabit some Northern parts of America, he engaged in that adventure; but returned soon after, the attempt proving unsuccessful. In 1580, the pope having incited the Irish to rebellion, he had a captain’s commission under the lord deputy of Ireland, Arthur Grey, lord Grey de Wilton. Here he distinguished himself by his skill and bravery. In 1581, the earl of Ormond departing for England, his government of Munster was given to captain Ralegh, in commission with sir * William Morgan and captain Piers Ralegh resided chiefly at Lismore, and spent all this summer in the woods and country adjacent, in continual action with the rebels. At his return home, he was introduced to court, and, as Fuller relates, upon the following occasion. Her majesty, taking the air in a walk, stopped at a splashy place, in doubt whether to go on when Ralegh, dressed | in a gay and genteel habit of those tirhes, immediately cast off and spread his new plush cloak on the ground n which her majesty gently treading, was conducted 6ver clean and dry. 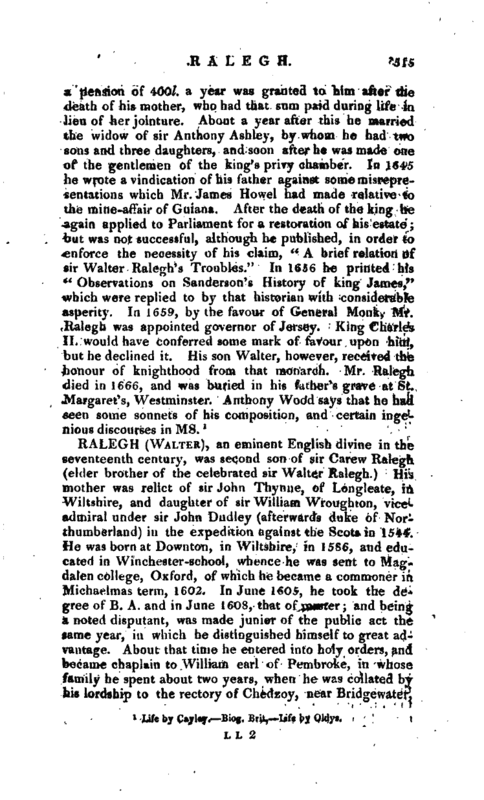 The truth is, Ralegh always made a very elegant appearance, as well in the splendor of attire, as the politeness of address; having a commanding figure, and a handsome and well-compacted person a strong natural wit, and a better judgment and that kind of courtly address which pleased Elizabeth, and led to herfaTOur. Such encouragement, however, did not reconcile hirn to an indolent life. In 1583 he set out with his brother sir H. Gilbert, in his expedition to Newfoundland but within a few days was obliged to return to Plymouth, his ship’s company -being seized with an infectious distemper and sir H. Gilbert was drowned in coming home, after he had taken possession of that country. These expeditions, however, being much to Ralegh’s taste, he still felt no discouragement; but in 1584 obtaining letters patent for discovering unknown countries, he set sail to America, and took possession of a place, to which queen Elizabeth gave the name of Virginia. Upon his return, he was elected member of parliament for Devonshire, and soon after knighted; an honour (says his late biographer), which, from the sparing hand of that monarch, was- considered as high distinction. About this period, also, he was favoured by a licence to sell wines throughout the kingdom. In 1585, he appears several ways engaged in the laudable improvements of navigation; for, he was one of the colleagues of the fellowship for the discovery of the North-west passage. The same year, he sent his own fleet upon a second voyage to Virginia, and afterwards upon a third. It was this colony of Virginia which first brought tobacco to England; and sir Walter Ralegh, who first introduced it into use. Queen Elizabeth had no objection to it, as a valuable article of commerce but her successor, James I. held it in such abhorrence, as to use his utmost endeavours to explode the use of it. 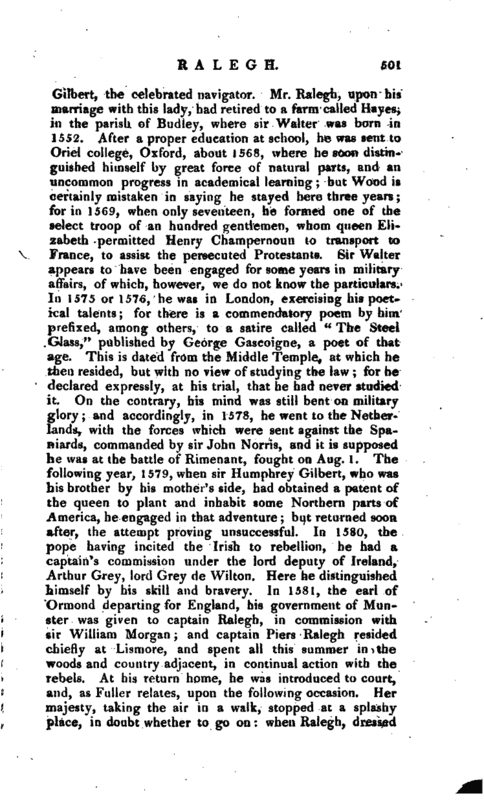 About the same time sir Walter was made seneschal of Cornwall and lord warden of the Stannaries. On ‘the suppression of the rebellion in Munster, when the forfeited lands were divided in signories, among those who had been active in its reduction, he obtained a grant of 12,000 acres in the counties of Cork and Waterford which he planted at his own expence; and, at the end of | this reign, sold to Richard Boyle, afterwards the great earl of Cork, who owned this purchase to have been the first step to his future vast fortune. Sir Walter was now become such a favourite with the queen, that they who had at first been his friends at court began to be alarmed, and to intrigue against him, particularly the earl of Leicester, his former patron, who is said to have grawn jealous of his influence with her majesty, eind ta have set up, in opposition to him, Robert Devereux, the young earl of Essex. To this he appears to have paid little attention, but constantly attended his public charge and employments, whether in town or country, as occasion required. He was, in 1586, a member of that parliament which decided the fate of Mary queen of Scots, in which he probably concurred. But still speculating on the consequences of the discovery of Virginia, he sent three ships upon a fourth voyage thither, in 1587. In 1588 he sent another fleet, upon a fifth voyage, to Virginia and the same year took a brave part in the destruction of the Spanish armada, sent to invade England. About this time he made an assignment to divers gentlemen and merchants of London, of all his rights in the colony of Virginia. This assignment is dated March 7, 1588-9. In April 1589, he accompanied don Antonio, the expelled king of Portugal, then in London, to his dominions, when an armament was sent to restore him and for his conduct on this occasion, was honoured by the queen with a gold chain. On his return to England, the same year, he touched upon Ireland, where he visited Spenser the poet, whom he brought to England, introduced into the queen’s favour, and encouraged by his own patronage, himself being no inconsiderable poet. Spenser has described the circumstances of sir Walter’s visit to him in a pastoral, which about two years after he dedicated to him, and entitled <: Colin Clout’s come home again.“In 1592 he was appointed general of an expedition against the Spaniards at Panama. Soon after this we find him again in the House of Commons, where he made a distinguished figure, as appears from several of his printed speeches. In the mean time, he was no great favourite with the people, and somewhat obnoxious to the clergy, not only on account of his principles, which were not thought very orthodox, but because he possessed some lands which had been taken from the church. His enemies, knowing this, ventured to attack him; and, | in 1593, he was aspersed with atheism, in a libel agairfst several ministers of state, printed at Lyons with this title:” Elizabeths Reginse Angliae Edictum, promulgatum Londini, Nov. 29, 1591; et Andr. 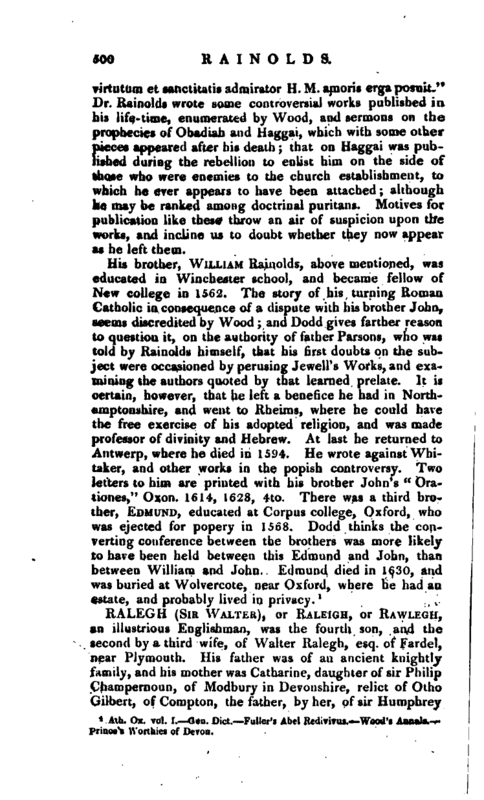 Philopatris ad idem responsio.“In this piece the writer, who was the Jesuit Parsons, inveighs against sir Walter Ralegh’s” School of Atheism“insinuating, that he was not content with being a disciple, but had set up for a doctor in his faculty. Osborn accounts for this aspersion thus:” Ralegh,“says he,” was the first, as I have heard, who ventured to tack about, and sail aloof from the beaten track of the schools; and who, upon the discovery of so apparent an error as a: torrid zone, intended to proceed in an inquisition after more solid truths till the mediation of some, whose livelihood lay in hammering shrines for this superannuated study, possessed queen Elizabeth, that such a doctrine was against God no less than her father’s honour, whose faith, if he owned any, was grounded upon school-divinity. Whereupon she chid him, who was, by his own confession, ever after branded with the title of Atheist, though a known asserter of God and providence." That he was such an assert er, has been universally allowed yet Wood not only adopts the unfavourable opinion of his principles, but pretends to tell us from whom he imbibed them. About the same time, 1593, Ralegh had an illicit amour with a beautiful young lady, Elizabeth, daughter of sir Nicolas Throgmorton, an able statesman and ambassador which so offended the queen, that they were both confined for several months and, when set at liberty, forbidden the court. Sir Walter afterwards made the most honourable reparation he could, by marrying the object of his affection; and he always lived with her in the strictest conjugal harmony. The next year he was so entirely restored to the queen’s favour, that he obtained a grant from her majesty of the manor of Sherborne, in Dorsetshire, which had been alienated from the see of Salisbury by bishop Caldwell, and was doubtless one of those church- lands, for accepting which he was censured, as mentioned above. During his disgrace he projected the discovery and conquest of the large, rich, and beautiful empire of Guiana, in South America; and, sending first an old experienced officer to collect information concerning it, he went thither himself jn 1595, destroyed the city of San Joseph, and took the Spanish governor. Upon his return, he mote a discourse | t)f his discoveries in Guiana, which was printed in 1596, 4to, and afterwards inserted in the third volume of Hakluyt’s voyages, in Birch’s works of Ralegh, and in Mr. Cayley’s late “Life of Ralegh.” His second attempt on Guiana was conducted by Lawrence Keymis, who sailed in Jan. 1596, and returned in June following. An account of this also is to be found in Hakluyt. The same year, sir Walter had a chief command in the Cadiz action, under the earl of Essex, in which he took a very able and gallant part. In the “Island Voyage,” in 1597, which was aimed principally at the Spanish plate-fleets, Ralegh was one of the principal leaders and would have been completely successful, had he not been thwarted by the jealousy and presumption of Essex. This unhappy nobleman’s misfortunes were now coming on and Ralegh, who had long been at variance with him, contributed to hasten his fall, particularly by a most disgraceful and vindictive letter which he wrote to sir Robert Cecil, to prevent his showing any lenity to Essex. 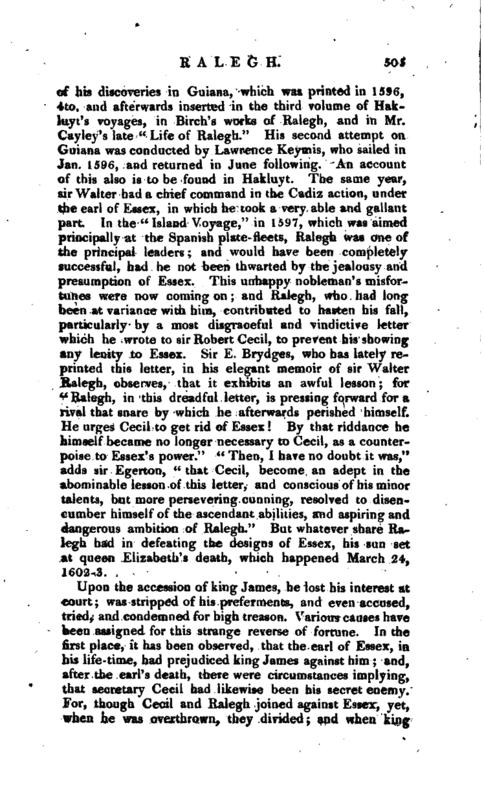 Sir E. Brydges, who has lately reprinted this letter, in his elegant memoir of sir Walter Ralegh, observes, that it exhibits an awful lesson for “Ralegh, in this dreadful letter, is pressing forward for a rival that snare by which he afterwards perished himself. He urges Cecil to get rid of Essex! By that riddance he himself became no longer necessary to Cecil, as a counterppise to Essex’s power.” “Then, I have no doubt it was,” adds sir Egerton, “that Cecil, become an adept in the abominable lesson of this letter, and conscious of his minor talents, but more persevering cunning, resolved to disencumber himself of the ascendant abilities, and aspiring and dangerous ambition of Ralegh.” But whatever share \ftalegh had in defeating the designs of Essex, his sun set at queen Elizabeth’s death, which happened March 24, 1602-3. Upon the accession of king James, he lost his interest at court; was stripped of his preferments, and even accused, tried, and condemned for high treason. Various causes have been assigned for this strange reverse of fortune. In the first place, it has been observed, that the earl of Essex, in his life-time, had prejudiced king James against him and, after the earl’s death, there were circumstances implying, that secretary Cecil had likewise been his secret enemy. For, though Cecil and Ralegh joined against Essex, yet, when he was overthrown, they divided; and when king | James came to England, sir Walter presented to him a memorial, in which he reflected upon Cecil in the affair of Essex ’, and, vindicating himself, threw the whole blame upon the other. He farther laid open, at the end of it, the conduct of Cecil concerning Mary queen of Scots, his majesty’s mother and charged the death of that unfortunate princess on him which, however, only irritated Cecil the more againstRalegh, without producingany efFecton the king. But, what seems alone sufficient to have incensed the king against Ralegh was, his joining with that party of Englishman, who, jealous of the concourse of Scotchmen who came to court, wished to restrict his majesty in the employment of these his countrymen. We are toid, however, that the king received him for some time with great kindness; but this time must have been short, for on July 6, 1603, he was examined before the lords of the council at Westminster, and returned thence a private prisoner to his own house. He was indicted at Staines, September 21, and not long after committed to the Tower of London; whence he was carried to Winchester, tried there November 17, and condemned to die. 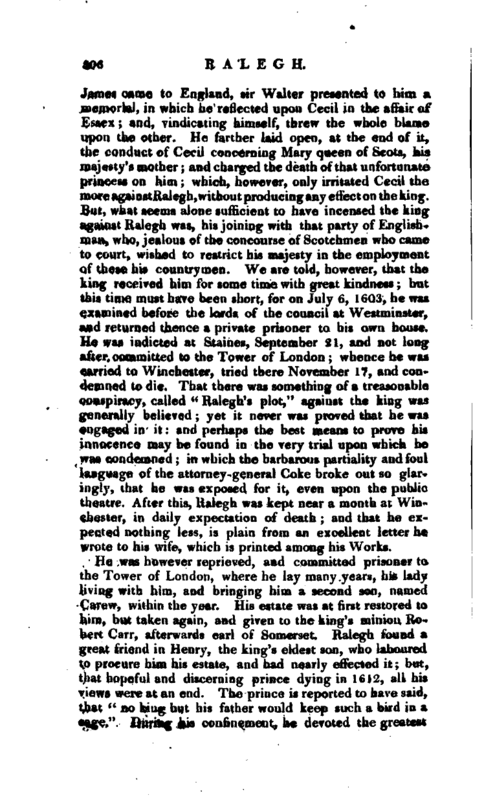 That there was something of a treasonable conspiracy, called “Ralegh’s plot,” against the king was generally believed yet it never was proved that he was engaged in it and perhaps the best means to prove his innocence may be found in the very trial upon which he was condemned; in which the barbarous partiality and foul language of the attorney-general Coke broke out so glaringly, that he was exposed for it, even upon the public theatre. 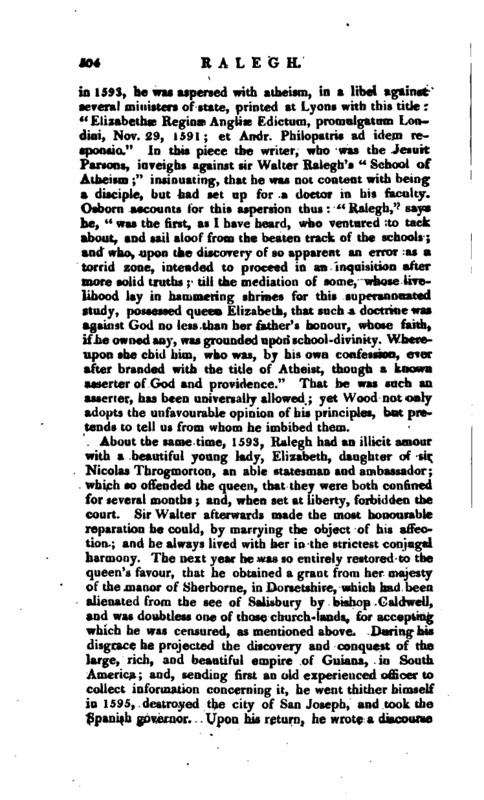 After this, Ralegh was kept near a month at Winchester, in daily expectation of death; and that he expected nothing less, is plain from an excellent letter he wrote to his wife, which is printed among his Works. He was however reprieved, and committed prisoner to the Tower of London, where he lay many years, his lady living with him, and bringing him a second son, named Carew, within the year. His estate was at first restored to him, but taken again, and given to the king’s minion Robert Carr, afterwards earl of Somerset. Ralegh found a great friend in Henry, the king’s eldest son, who laboured to procure him his estate, and had nearly effected it; but, that hopeful and discerning prince dying in 1612, all his views were at an end. The prince is reported to have said, that “no king but his father would keep such a bird in a cage.” During his confinement, he devoted the greatest | part of his time to reading and writing, and indeed the productions, of his pen at this time are as many, a if original writing and compilation had been the whole pursuit of his life. His writings have been divided into poetical, epistolary, military, maritimal, geographical, political, philosophical, and historical. But, however excellent these miscellanies are allowed by others to be written, he considered them as trivial amusements compared to his grand work “The History of the World;” the first volume of which was published in 1614, folio, and extends to the end of the Macedonian empire. As to a report respecting the second volume of this history, which, it is said, he burned because the first had sold so slowly that it had ruined his bookseller, it is scarcely worth notice; for it appears that there was a second edition of it printed by the same bookseller, within three years after the first. According to his own evidence, he had certainly planned a second and third volume; but was persuaded to lay them aside by the death of prince Henry, to whose use they were dedicated, and the course of his life afterwards left no room for a labour of this magnitude. Of the “History” it has been said, that the design was equal to the great-ness of his mind, and the execution to the strength of his parts, and the variety of his learning. His style is pure, nervous and majestic; and much better suited to the dignity of history, than that of lord Bacon. 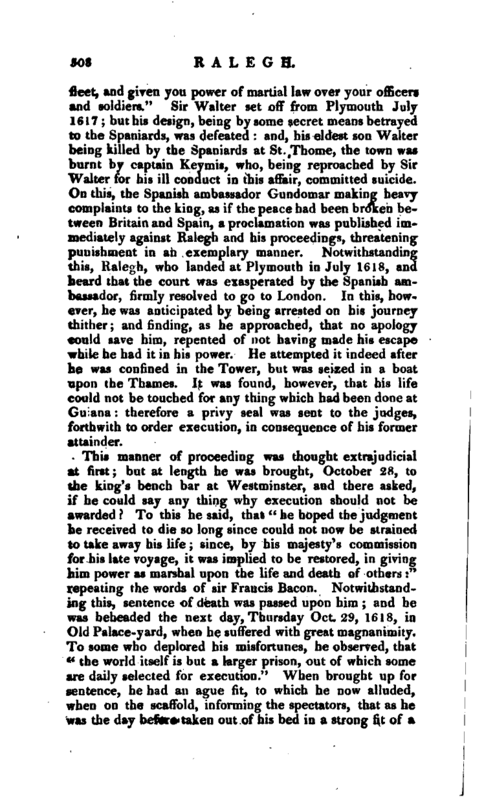 Ralegh seems to have written for posterity, Bacon for the reign of James I. This admirable work of Ralegh has been thought a just model for the reformation of our language, yet is now little read or consulted. 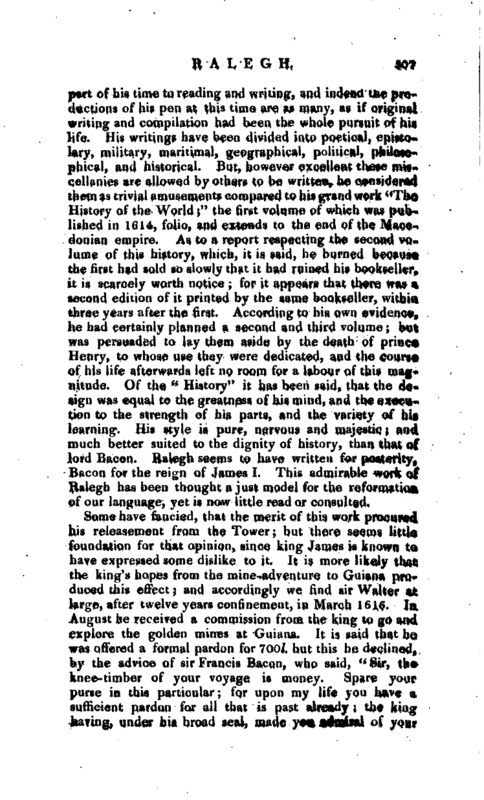 Some have fancied, that the merit of this work procured his releasement from the Tower; but there seems little foundation for that opinion, since king James is known to have expressed some dislike to it. It is more likely that the king’s hopes from the mine-adventure to Guiana produced this effect; and accordingly we find sir Walter at large, after twelve years confinement, in March 1616. In August he received a commission from the king to go and explore the golden mines at Guiana. It is said that he was offered a formal pardon for Too/, but this he declined, by the sdvice of sir Francis Bacon, who said, “Sir, the knee-timber of your voyage is money. Spare your purse in this particular; for upon my life you have a sufficient pardon for all that is past already the king having, under his broad seal, made you admiral of your | fleet, and given you power of martial law over your officers and soldiers.” Sir Walter set off from Plymouth July 1617 but his design, being by some secret means betrayed to the Spaniards, was defeated and, his eldest son Walter being killed by the Spaniards at St. /Thome, the town was burnt by captain Keymis, who, being reproached by Sir Walter for his ill conduct in this affair, committed suicide. On this, the Spanish ambassador Gundomar making heavy complaints to the king, as if the peace had been broken between Britain and Spain, a proclamation was published immediately against Ralegh and his proceedings, threatening punishment in an exemplary manner. Notwithstanding this, Ralegh, who landed at Plymouth in July 1618, and heard that the court was exasperated by the Spanish ambassador, firmly resolved to go to London. In this, however, he was anticipated by being arrested on his journey thither and finding, as he approached, that no apology could save him, repented of not having made his escape while he had it in his power. He attempted it indeed after ie was confined in the Tower, but was seized in a boat upon the Thames. It was found, however, that his life could not be touched for any thing which had been done at Guiana: therefore a privy seal was sent to the judges, forthwith to order execution, in consequence of his former attainder. This manner of proceeding was thought extrajudicial at first; but at length he was brought, October 28, to the king’s bench bar at Westminster, and there asked, if he could say any thing why execution should not be awarded? 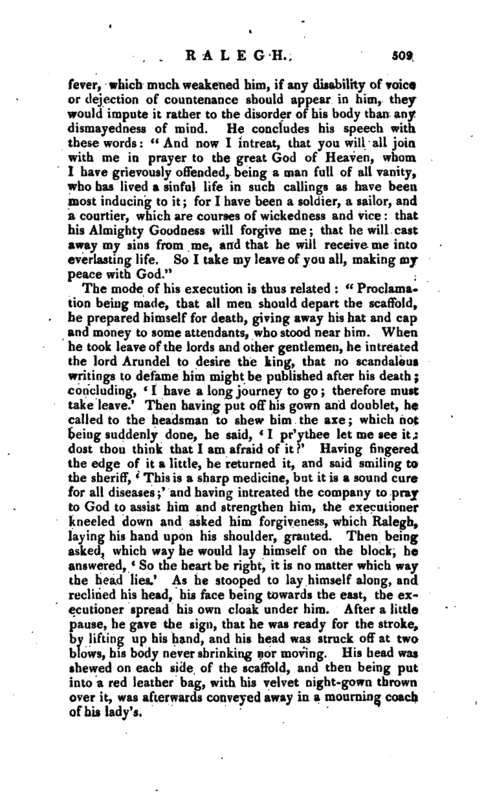 To this he said, that ‘’he hoped the judgment he received to die so long since could not now be strained to take away his life; since, by his majesty’s commission for his late voyage, it was implied to be restored, in giving him power as marshal upon the life and death of others:“repeating the words of sir Francis Bacon. Notwithstanding this, sentence of death was passed upon him; and he was beheaded the next day, Thursday Oct. 29, 1618, in Old Palace-yard, when he suffered with great magnanimity. To some who deplored his misfortunes, he observed, that” the world itself is but a larger prison, out of which some are daily selected for execution.“When brought up for sentence, he had an ague fit, to which he now alluded, when on the scaffold, informing the spectators, that as he was the day before taken out of his bed in a strong fit of a | fever, which much weakened him, if any disability of voice or dejection of countenance should appear in him, they would impute it rather to the disorder of his body than any dismayedness of mind. He concludes his speech with these words” And now I intreat, that you will all join with me in prayer to the great God of Heaven, whom I have grievously offended, being a man full of all vanity, who has lived a sinful life in such callings as have been most inducing to it; for I have been a soldier, a sailor, and a courtier, which are courses of wickedness and vice that his Almighty Goodness will forgive me; that he will cast away my sins from me, and that he will receive me into everlasting life. So I take my leave of you all, making my peace with God." The mode of his execution is thus related “Proclamation being made, that all men should depart the scaffold, he prepared himself for death, giving away his hat and cap and money to some attendants, who stood near him. When he took leave of the lords and other gentlemen, he intreated the lord Arundel to desire the king, that no scandalous writings to defame him might be published after his death; concluding, ‘I have a long journey to go; therefore must take leave.’ Then having put off his gown and doublet, he called to the headsman to shew him the axe which not being suddenly done, he said, ‘ I pr’ythee let me see it dost thou think that I am afraid of it?‘ Having fingered the edge of it a little, he returned it, and said smiling to the sheriff, ’ This is a sharp medicine, but it is a sound cure for all diseases’ and having intreated the company to pray to God to assist him and strengthen him, the executioner kneeled down and asked him forgiveness, which Ralegh, laying his hand upon his shoulder, granted. Then being asked, which way he would lay himself on the block, he answered, * So the heart be right, it is no matter which way the head lies.‘ - As he stooped to lay himself along, and reclined his head, his face being towards the east, the executioner spread his own cloak under him. After a little pause, he gave the sign, that he was ready for the stroke, by lifting up his hand, and his head was struck off at two blows, his body never shrinking nor moving. His head was shewed on each side of the scaffold, and then being put into a red leather bag, with his velvet night-gown thrown over it, was afterwards conveyed away in a mourning coach of his lady’s. | His body was interred in St. Margaret’s Westminster; but his head was preserved by his family many years. The sacrificing such a man to the will of the court of Spain, a power detestable for the attempt of the armada, and contemptible by its defeat, has ever since been mentioned with general indignation. 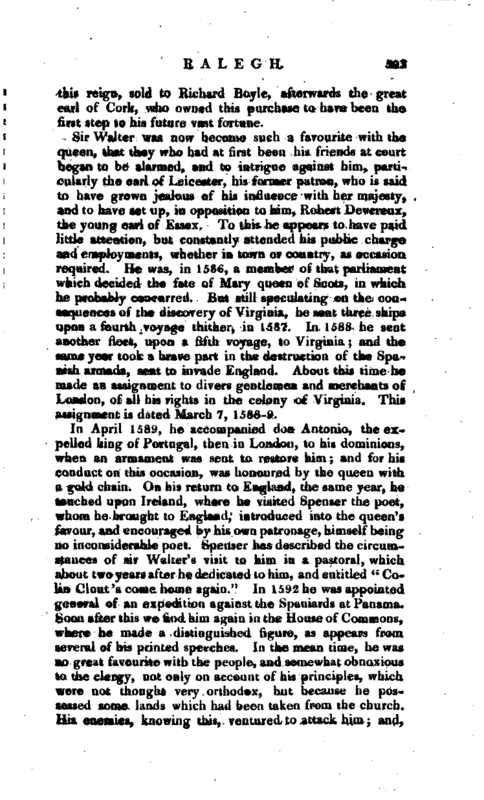 Burnet, speaking of certain errors in James I.’s reign, proceeds thus:” Besides these public actings, king James suffered much in the opinion of all people, by his strange way of using one of the greatest men of that age, sir Walter Ralegh; against whom the proceedings at first were censured, but the last part of them was thought both barbarous and illegal.“Arid a little farther:” the first condemnation of him was very black; but the executing him after so many years, and after an employment that had been given him, was counted a barbarous sacrificing him to the Spaniards." Sir Walter’s death gave such disgust to the people, that the king published a declaration, in justification of the measure, which only increased the odium naturally generated by such highly disgraceful acts. But that the pleasure of Spain, and that only, was the cause, was confessed by one of the ministers, who wrote to Cottingham, our agent then in Spain, desiring him to represent to that court, “in how many actions of late, his majesty had strained upon the affections of his people, and especially in this last concerning sir Walter Ralegh,” whose character Cottingham was likewise desired to magnify, that Spain might see at what price James was willing to purchase her favour. Sir Walter was tall, to the height of six feet, well shaped, and not too slender; his hair of a dark colour, and full; and the features and form of his face such as they appear before the last edition of his History in 1736. His jaste in dress, both civil and military, was magnificent. Of the latter sort, his armour was so rare, that we are told part of it was for its curiosity preserved in the Tower: and his civil wardrobe was richer, his clothes being adorned with jewels of great value. The truth is, the richness of his apparel was made matter of reproach to him; but, though he was undoubtedly pleased with the distinction, he was far from making it the end of his ambition: for, how much he excelled in arms abroad, counsel at home, and letters in general, history and his own writings have | made sufficiently notorious. One great blot on his character we have already noticed. He was naturally ambitious, and he was bred in a school where scruples as to the means of gratification were not yet taught. His works may be divided into classes, according to Oldys’s arrangement, 1. 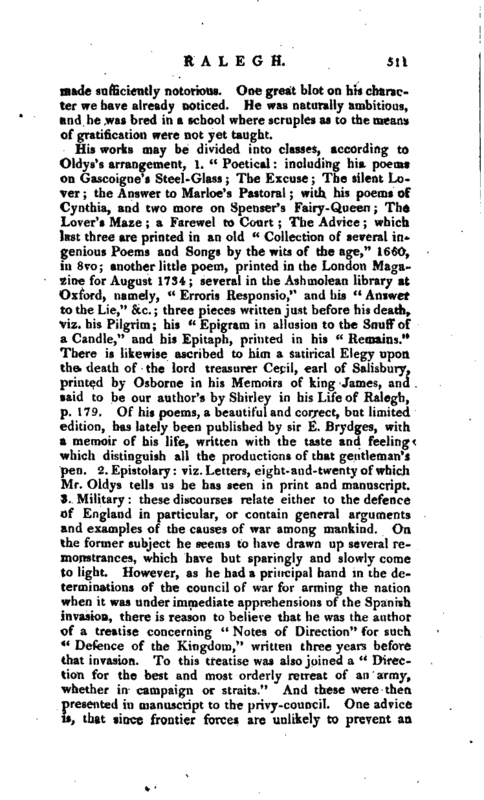 “Poetical: including his poems on Gascoigne’s Steel-Glass; The Excuse; The silent Lover; the Answer to Marloe’s Pastoral; with his poems of Cynthia, and two more on Spenser’s Fairy-Queen; The Lover’s Maze; a Farewei to Court; The Advice; which last three are printed in an old” Collection of several ingenious Poems and Songs by the wits of the age,“1660, in 8vo; another little poem, printed in the London Magazine for August 1734; several in the Ashmolean library at Oxford, namely,” Erroris Responsio,“and his” Answer, to the Lie,“&c. three pieces written just before his death, viz. 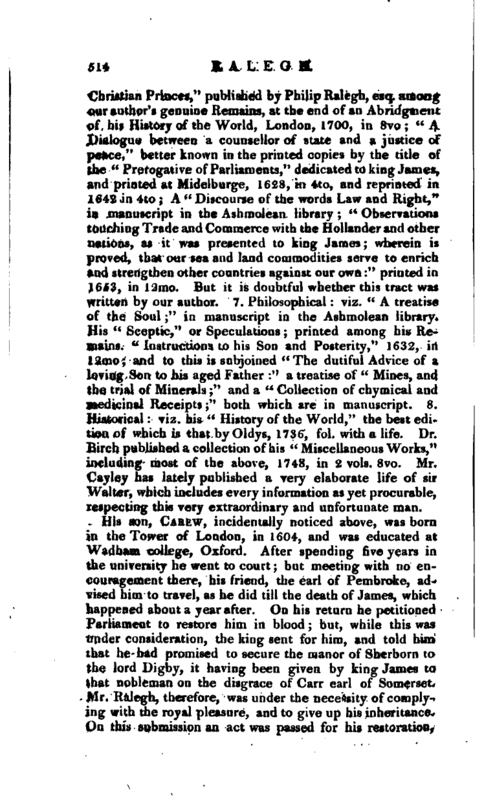 his Pilgrim; his” Epigram in allusion to the Snuff‘ of a Candle,“and his Epitaph, printed in his” Remains.“There is likewise ascribed to him a satirical Elegy upon the death of the lord treasurer Cecil, earl of Salisbury, printed by Osborne in his Memoirs of king James, and said to be our author’s by Shirley in his Life of Ralegh, p. 179. Of his poems, a beautiful and correct, but limited edition, has lately been published by sir E. JBrydges, with a memoir of his life, written with the taste and feeling which distinguish all the productions of that gentleman’s pen. 2. Epistolary: viz. Letters, eight-and-twenty of which Mr. Oldys tells us he has seen in print and manuscript. 3. Military: these discourses relate either to the defence of England in particular, or contain general arguments and examples of the causes of war among mankind. On the former subject he seems to have drawn up several remonstrances, which have but sparingly and slowly come to light. However, as he had a principal hand in the determinations of the council of war for arming the nation when it was under immediate apprehensions of the Spanish invasion, there is reason to believe that he was the author of a treatise concerning” Notes of Direction“for such” Defence of the Kingdom,“written three years before that invasion. To this treatise was also joined a cc Direction for the best and most orderly retreat of an army, whether in campaign or straits.” And these were then presented in manuscript to the privy-council. One advice is, that since frontier forces are unlikely to prevent an | enemy from landing, if they should land through the deficiency or absence of our shipping (for this is the force which Ralegh was ever for having first used against such foreign invasions) it were better by driving or clearing the country of provisions, and temporizing, to endeavour at growing stronger, and rendering the enemy weaker, than to hazard all by a confused and disorderly descent of the populace to oppose the first landing, as their custom was formerly. But this was one of the chief points, which a little before the approach of the Spanish armada was opposed by Thomas Digges, esq. muster-master-general of the queen’s forces in the Low Countries, in a “Discourse of the best order for repulsing a foreign Force,” &c. which he then published. This occasioned an Answer, which having been found in an old manuscript copy among others of sir Walter Ralegh’s discourses, and several circumstances agreeing with the orders in the council of war, as well as some passages in his “History of the World,” and his other writings, it was published by Nathaniel Booth, of Gray’s Inn, esq. 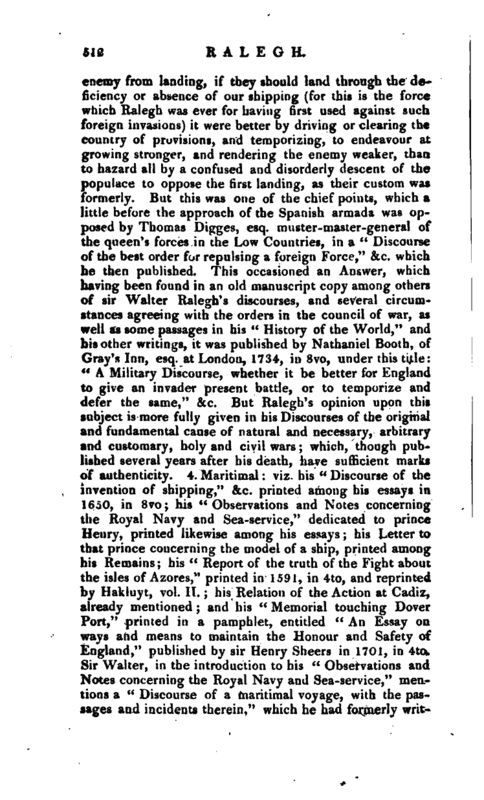 at London, 1734, in 8vo, under this title: “A Military Discourse, whether it be better for England to give an invader present battle, or to temporize and defer the same,” &c. But Ralegh’s opinion upon this subject is more fully given in his Discourses of the original and fundamental cause of natural and necessary, arbitrary and customary, holy and civil wars; which, though published several years after his death, have sufficient marks of authenticity. 4. Maritimal: viz. his “Discourse of the invention of shipping,” &c. printed among his essays in 1650, in 8vo; his “Observations and Notes concerning the Royal Navy and Sea-service,” dedicated to prince Henry, printed likewise among his essays; his Letter to that prince concerning the model of a ship, printed among his Remains; his “Report of the truth of the Fight about the isles of Azores,” printed in 1591, in 4to, and reprinted by Hakluyt, vol. It. ; his Relation of the Action at Cadiz, already mentioned; and his “Memorial touching Dover Port,” printed in a pamphlet, entitled “An Essay on ways and means to maintain the Honour and Safety of England,” published by sir Henry Sheers in 1701, in 4to. 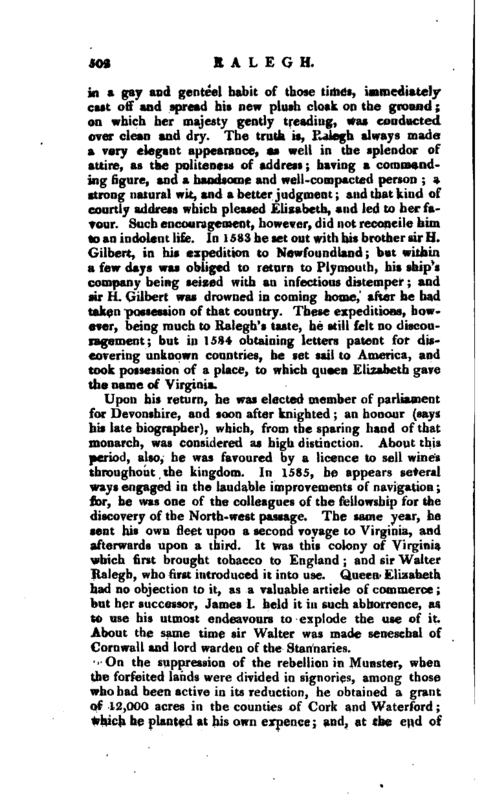 Sir Walter, in the introduction to his “Observations and Notes concerningthe Royal Navy and Sea-service,” men* tions a “Discourse of a maritimal voyage, with the passages and incidents therein,” which he bad formerly | written to prince Henry; and in his “History of the World” he takes notice of another treatise, written to the same prince, “Of the art of War by Sea;” “a subject to my knowledge,” says he, “never handled by any man, ancient or modern; but God has spared me the labour of finishing it, by the loss of that brave prince; of which, like an eclipse of the sun, we shall find the effects hereafter.” 5. Geographical; viz. several discourses and papers of his concerning the discovery, planting, and settlement of Virginia, which were formerly in the hands of sir Francis Walsingham “A treatise of the West Indies;” “Considerations on the Voyage for Guiana,” a manuscript containing leaves in 4to, in the library of sir Hans Sloane, bart. and now in the British Museum “Discovery of the large, rich, and beautiful empire of Guiana,” pqblished by himself, and mentioned above. His “Journal of his second Voyage to Guiana,” which remains still in manuscript; and his “Apology” for the said voyage. 6. Political viz. “The Seat of Government,” shewing it to be upheld by the two great pillars of civil justice and martial policy; “Observations concerning the causes of the magnificency and o’pulency;” “The Prince; or Maxims of State,” printed at London, 1642, in 4to. Wood says that it is the same with “Aphorisms of State,” published by John Milton at London, in 1661, in 8vo. “The Cabinet-Council, containing the chief arts of Empire, and mysteries of State discabineted,” &c. published by John Milton, esq. London, 1658, 8vo. In the second edition at London, 1692, 8vo, it is entitled “The Arts of Empire and mysteries of State discabineted,” &c. “The Spaniard’s Cruelties to the English in Havanria” his “Consultation about the Peace with Spain” and our protecting the Netherlands, in manuscript. 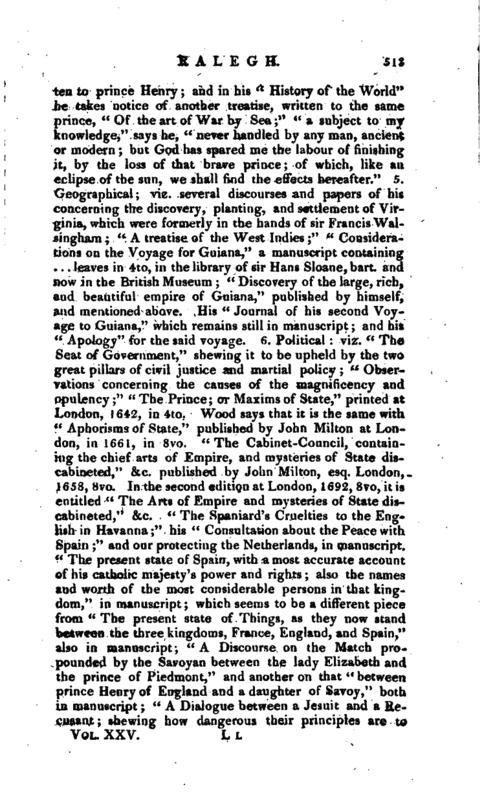 “The present state of Spain, with a most accurate account of his catholic majesty’s power and rights also the names and worth of the most considerable persons in that kingdom,” in manuscript; which seems to be a different piece from “The present state of Things, as they now stand between the three kingdoms, France, England, and Spain,” also in manuscript; “A Discourse on the Match propounded by the Savoyan between the lady Elizabeth and the prince of Piedmont,” and another on that “between, prince Henry of England and a daughter of Savoy,” both in manuscript “A Dialogue between a Jesuit and a i\ecusarit shewing how claugv rous their principles are to | Christian Princes,” published by Philip Ralegh, esq. among jour author’s genuine Remains, at the end of an Abridgment of his History of the World, London, 1700, in 8vo; “A Dialogue between a counsellor of state and a justice of peace,” better known in the printed copies by the title of the “Prerogative of Parliaments,” dedicated to king James, and printed at Midelburge, 1628, in 4to, and reprinted in 1643 in 4to A “Discourse of the words Law and Right,” jn manuscript in the, Ashmolean library “Observations touching Trade and Commerce with the Hollander and other nations, as it was presented to king James; wherein is prqve.d, that our sea and land commodities serve to enrich and strengthen other countries against our own” printed in 1653, in 12mo. But it is doubtful whether this tract was written by our author. 7. Philosophical viz. “A treatise of the Soul” in manuscript in the Ashmolean library, His “Sceptic,” or Speculations printed among his Remains. “Instructions to his Son and Posterity,” 1632, in J2mo; and to this is subjoined “The dutiful Advice of a Joving Son to his aged Father:”. a treatise of “Mines, and the trial of Minerals;” and a “Collection of chymical and medicinal Receipts;” both which are in manuscript, 8. Jiistorical: viz. his “History of the World,” the best edition of which is that by Oldys, 1736, fol. with a life. Dr. Birch published a collection of his “Miscellaneous Works,” including most of the above, 1748, in 2 vols. 8vo. 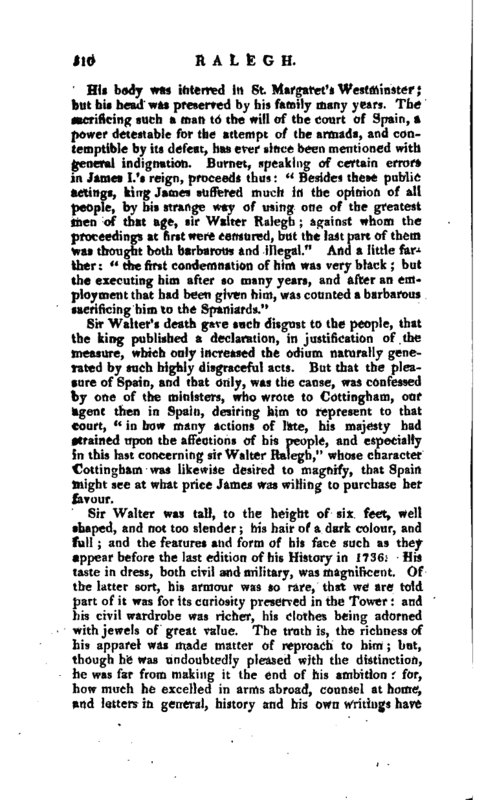 Mr, Cayley has lately published a very elaborate life of sir Walter, which includes every information as yet procurable, respecting this very extraordinary and unfortunate man. Life by Cayley. Biog. Brit, Lift by Oldys.